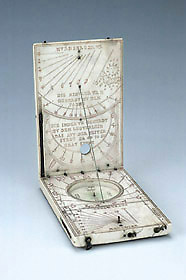 This dial has a wind rose, a table of latitudes and dials for Italian, Babylonian and Nuremberg hours. As in other diptych dials there is an inscription about the use of the instrument, in this case the instruction is about the adjustment of the string gnomon dial. On the outer side of the lower leaf there is also an indication about the magnetic properties of the compass.